After a security review at the Delaware Valley School District does not pass the grade, heightened security measures are put in place that feature upgraded technology and the latest devices. Active shooters and other violent scenarios have school districts across the country taking a closer look at their current security systems and technology to ensure they can deliver in an emergency. Criminal activity within the Delaware Valley School District is not a common occurrence. However, security is a priority, and the DVR system that covered Delaware Valley’s seven schools and nine buildings was no longer meeting the district’s needs. Unlike other school districts of its size, Delaware Valley has its own, full-time, six-person police force. Upon a review of the surveillance system in place, officers and district administrators point out that it is difficult to view and manage video from all of the cameras as a unified system. Poor quality analog video makes it hard to identify faces and see other important details. There are blind spots, and the outdoor PTZ cameras that pan back and forth are causing them to miss a lot of activity. Christopher Lordi, director of Administrative Services at Delaware Valley School District in rural northeast Pennsylvania, decides it is time to upgrade his district’s surveillance technology. Lordi turns to the integration expertise of Guyette Communications to deliver a solution with the ability to clearly identify the faces of visitors, read license plates within the school parking lots, eliminate blind spots throughout the campuses, and easily search video to quickly find evidence of crime or vandalism. Scott Surochak and Rick Scalzo, both of Guyette Communications, Plymouth, Pennsylvania, do a complete evaluation. They recommend a system overhaul to a new-to-market VMS and propose that the district abandon analog cameras districtwide and standardize on higher performance, megapixel IP models. The significant expense of replacing not only the VMS system but also hundreds of cameras districtwide requires buy-in from the school board. After providing an in-depth demonstration of the capabilities of Vicon’s new Valerus VMS, along with its line of IQeye Alliance cameras, the school board gives the green light to proceed with the installation of approximately 400 Vicon megapixel cameras, multiple application servers, and NVRs running Valerus VMS software. The cameras provide coverage of all entrances to buildings, busy hallways, and spaces like lunchrooms, auditoriums, playgrounds, and athletic fields. Parking lot cameras capture license plates. To support the high number of high-resolution cameras transmitting at full frame rates, Guyette installs a dedicated security network capable of handling the bandwidth. All cameras are hardwired with new CAT-6 cabling, which feeds back to CISCO switches and a fiber backbone that runs through each building. To minimize bandwidth transmission between buildings, Guyette sets up each school locally to record video from its respective cameras. Complete user and administrative functionality is available through a standard Web browser interface. 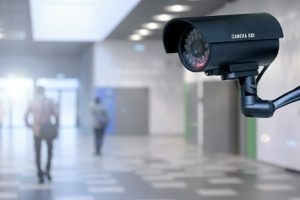 The school’s police force is now empowered to better maintain safety through access to high-resolution video viewable from workstations and smartphones. Strategically placed cameras eliminate blind spots. The thin-client interface gives complete viewing flexibility, including the option to share video with local or state law enforcement. Crimes are being solved that would not have been possible with the previous system. Within the first months of installation, the system is tested and successfully identifies an individual responsible for theft on school grounds. Join us for the Education & Healthcare Security Forum, a complimentary event specifically targeted for senior-level Security Professionals in Education and Healthcare sectors. Our next event takes place October 22 & 23 , 2018 in City of Industry, CA. Stay for free at the Pacific Palms Resort and network with your peers while sourcing new and innovative security solutions.